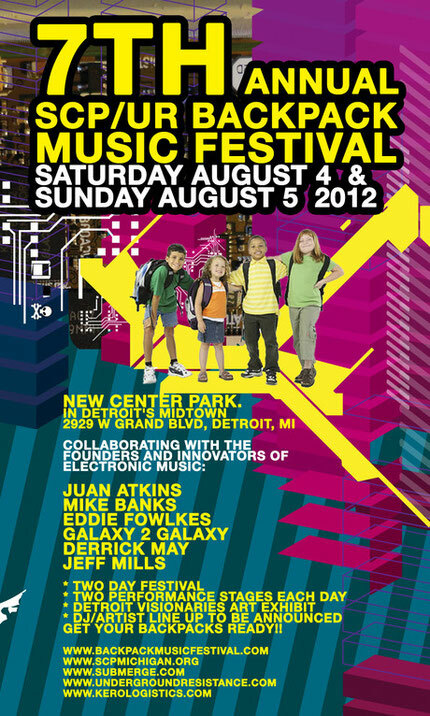 The 7th SCP Backpack Music Festival in Detroit was recently announced, the annual event that raises thousands of dollars, backpacks and school supplies to benefit Detroit inner city children. This year’s festival will be held August 4-5 at New Center Park located in Detroit’s vibrant Midtown. The festival is the work of Derrick May (Transmat), Mad Mike of Underground Resistance, SCP founder Judy Shelton, John Collins (UR), Artistic Director and various other supporters. The annual festival is celebrating its seventh year. Nearly $30,000 in money and backpacks filled with school supplies have gone to about 1,500 students since its inception. Organizers hope to meet or exceed the seven year total in 2012. Thousands of people are expected to attend the August weekend event, which draws a diverse group of people from across southeast Michigan. The music festival began as a picnic on Belle Isle Park in Detroit, and has evolved into a large festival and art exhibit that will feature DJ sets by Derrick May, Eddie Fowlkes, Juan Atkins, John Collins (UR), DJ Skurge (UR), Terrence Parker, Rick Wilhite, DJ Minx, Pirahnahead, Wayne Williams and many more. In addition to live performances by Galaxy 2 Galaxy (UR). Timeline (UR) and international recording artist, Michelle Weeks.